The old lady who lived on the other side of my fence planted Morning Glories along her edge of the property line about 10 years ago. 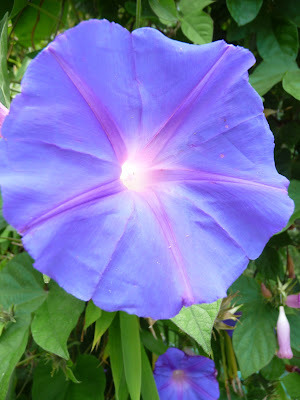 The variety she chose sports beautiful, big flowers in a saturated blue with lavendar radiating "stars." Gorgeous! 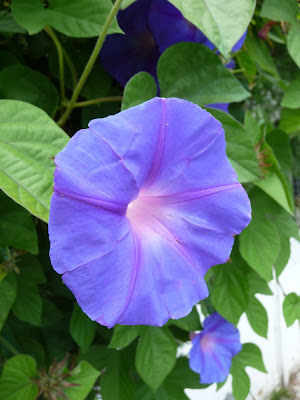 Morning Glories aren't worth a darn as a cut flower; their blooms wilt almost before you can carry them to your kitchen door. But the color is so glorious! You just have to admire them on the vine. MG's are very aggressive. They send out shoots in all directions over amazing distances, twisting their way around anything that isn't moving. They can choke the life out of other plants if left unchecked; here they're doing their best to strangle some pool equipment to death. 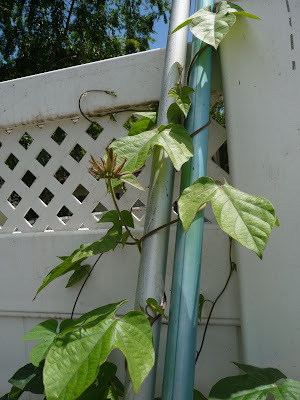 I am constantly whacking their grasping tentacles back away from my trees and bushes, because if they get a toehold, they'll kill everything I've planted. 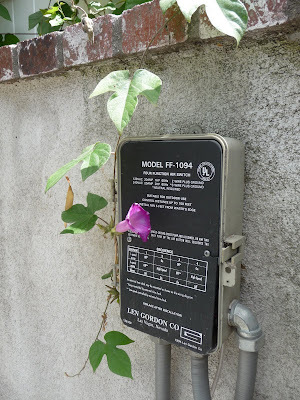 Although they do add a certain graceful beauty to the ugly bits of a back yard. 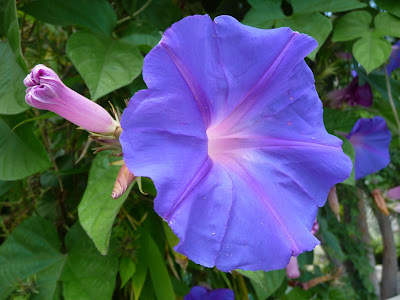 The old lady is dead and gone, but her Morning Glories live on. And on. And on.